The concept of now ubiquitous touchscreen interface was put into words in October, 1965, when Eric Arthur Johnson, an engineer at the Royal Radar Establishment in Malvern, England, who was interested in developing touchscreen for air traffic control, described his ideas for a capacitive touchscreen (see the nearby photo from 1967) in a short 2-pages article in (Touch Display—A novel input/output device for computers. Electronics Letters, 1(8), 219-220). It was a device with wires, sensitive to the touch of a finger, on the face of a cathode-ray tube on which information can be written by the computer. In 1967, Johnson published another more comprehensive paper on the topic (Touch Displays: A Programmed Man-Machine Interface, Ergonomics, 10(2), 271-277), this time explaining how the technology worked through diagrams and photographs of a prototype. 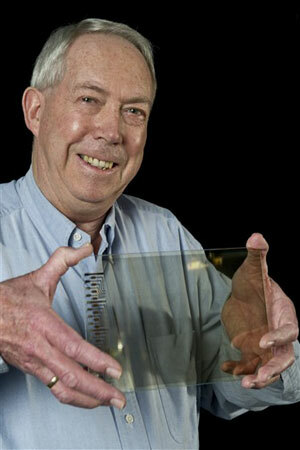 Johnson was granted a US patent for his invention in 1969 (see the US patent 3482241). In the early 1972, the Danish engineer (who had an experience from a television factory in the early 1960s), working in CERN—Bent Stumpe (see the nearby photo), was asked by Frank Beck, who was in charge of the central control hub in the SPS (Super Proton Synchrotron) control room, to build the hardware for an intelligent system which, in just three console units, would replace all those conventional buttons, switches, etc. In just a few days, in March, 1972, Stumpe came up with a proposal to build a touch screen with a fixed number of programmable buttons, a tracker ball to be used as computer-controlled pointing device (something like mouse) and a programmable knob. 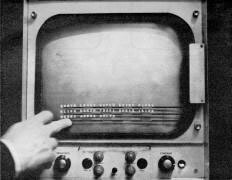 The first touchscreens were installed in 1973 and remained in operation until 2008. In a capacitive touch-screen like the above-mentioned, the touch-sensitive area of the screen is actually part of an electric circuit. When a user touches the screen with his finger, he changes the dielectric of the capacitor, measurable as a change in capacitance. A special software calculates the differences in capacitance relative to areas on the screen that are not being touched and identifies exactly where on the screen the change occurred. This information is then used by another software to execute the desired operation. PLATO (Programmed Logic for Automated Teaching Operations) was the first generalized computer assisted instruction system, and, by the late 1970s, comprised several thousand terminals worldwide on nearly a dozen different networked mainframe computers. Originally, PLATO was built by the University of Illinois and functioned for four decades, offering coursework to UIUC students, local schools, and other universities. It established key on-line concepts as: forums, message boards, online testing, e-mail, chat rooms, picture languages, instant messaging, remote screen sharing, and multi-player games. In 1972 a new system PLATO IV was launched into operation with a very innovative terminal. It included Bitzer's orange plasma display invention which incorporated both memory and bitmapped graphics into one display. This plasma display included fast vector line drawing capability and ran at 1260 baud, rendering 60 lines or 180 characters per second. The display was a 512x512 bitmap, with both character and vector plotting done by hardwired logic. Users could provide their own characters to support rudimentary bitmap graphics. 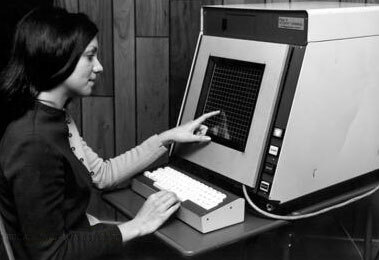 Compressed air powered a piston-driven microfiche image selector that permitted colored images to be projected on the back of the screen under program control. The PLATO IV display also included a 16-by-16 grid infrared touch panel allowing students to answer questions by touching anywhere on the screen.